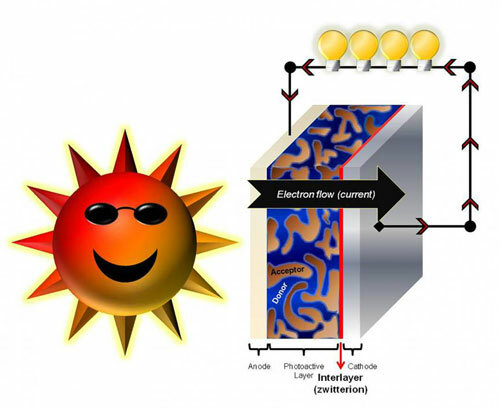 (Nanowerk News) For decades, polymer scientists and synthetic chemists working to improve the power conversion efficiency of organic solar cells were hampered by the inherent drawbacks of commonly used metal electrodes, including their instability and susceptibility to oxidation. Now for the first time, researchers at the University of Massachusetts Amherst have developed a more efficient, easily processable and lightweight solar cell that can use virtually any metal for the electrode, effectively breaking the 'electrode barrier' ("Fulleropyrrolidine interlayers: Tailoring electrodes to raise organic solar cell efficiency"). This barrier has been a big problem for a long time, says UMass Amherst’s Thomas Russell, professor of polymer science and engineering. “The sun produces 7,000 times more energy per day than we can use, but we can’t harness it well. One reason is the trade-off between oxidative stability and the work function of the metal cathode.” Work function relates to the level of difficulty electrons face as they transfer from the solar cell’s photoactive layer to the electrode delivering power to a device. Synthetic chemist and polymer science professor Todd Emrick agrees, “That challenge was unmet and that’s what this research is all about.” He and polymer chemistry doctoral student Zak Page in his lab had been synthesizing new polymers with zwitterions on them, applying them to several different polymer scaffolds in conjugated systems, also known as semiconductors, in the inter-layer of solar cells. Zwitterions are neutral molecules with both a positive and negative charge that also have strong dipoles that interact strongly with metal electrodes, the scientists found. Emrick asked Page to see if he could synthesize conjugated polymers, semiconductors, with zwitterionic functionality. With time, and by enlisting a system of multiple solvents including water, Page was able to prepare these new “conjugated polymer zwitterions,” or CPZs. Emrick explains, “Once we could make CPZs, we were able to incorporate any conjugated backbone we wanted with zwitterionic functionality. That allowed us to make a library of CPZs and look at their structure-property relationship to understand which would be most important in electronics. In particular, we were interested in electron transport efficiency and how well the CPZ could modify the work function of different metals to help move electons across interfaces towards more powerful devices. In choosing a metal for use as an electrode, scientists must always negotiate a trade-off, Page says. More stable metals that don’t degrade in the presence of water and oxygen have high work function, not allowing good electron transport. But metals with lower work function (easier electron transport) are not stable and over time will degrade, becoming less conductive. Guided by UMass Amherst’s photovoltaic facility director Volodimyr Duzhko in using ultraviolet photoelectron spectroscopy (UPS), Page began to categorize several metals including copper, silver and gold, to identify exactly what aided electron transport from the photoactive layer to the electrode. He and Emrick found that “if you want to improve the interlayer properties, you have to make the interface layer extremely thin, less than 5 nanometers, which from a manufacturing standpoint is a problem,” he says. Here the synthetic chemists turned to Russell’s postdoctoral researcher Yao Liu, giving him two different fullerene layers to test for electron transfer efficiency: C60-SB and another with amine components, C60-N. From UPS analysis of the zwitterion fullerene precursor, Page suspected that the amine type would enhance power even better than the C60-SB variety. Indeed, Liu found that a thin layer of C60-N between the solar cell’s photoactive layer and the electrode worked best, and the layer did not have to be ultra-thin to function effectively, giving this discovery practical advantages.